Barrier Light isn’t a preventive measure (like say sunscreen lotion), but is in-fact a diagnostic tool. 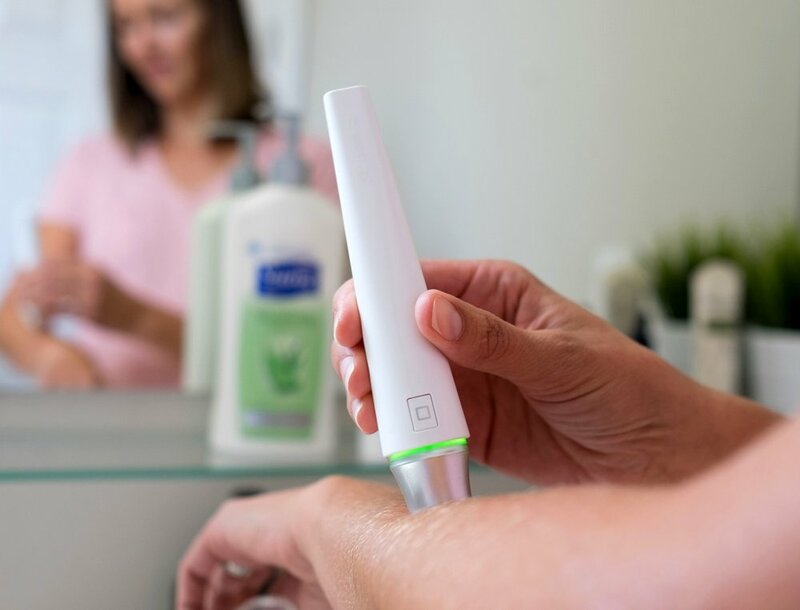 The pen-shaped device comes with 4 medical grade sensors capable of detecting your skin’s moisture and barrier strength. I envision a day when instruments like these will be a part of every home. With the way we humans have systematically degraded the quality of our environment, it’s no secret that the sun’s UV rays are now making their way through our depleting Ozone layer. Those effects show on our skin now, with people getting all sorts of skin complications from staying out in the sun too long… and it’s not just the sun, your skin is the first line of defense against pretty much anything from cosmetics, to fashion, to even your diet. The skin is usually quick to react to products that aren’t suited for you, often showing symptoms of an allergy. The Barrier Light isn’t a preventive measure (like say sunscreen lotion), but is in-fact a diagnostic tool. The pen-shaped device comes with 4 medical grade sensors capable of detecting your skin’s moisture and barrier strength. Devised as a result of not just environmental degradation but even the cosmetics boom, the Barrier Light understands what products and routines are the best for your skin. Barrier Light does this by measuring your skin’s moisture level, and its ability to hold onto moisture, along with the temperature and the environmental humidity. All one does is hold the pen against their skin (be it their face, arms, or anywhere else) for 10 seconds and that’s enough for the Barrier Light pen to perform its diagnosis. Keeping things minimal (read: portable) and bathroom counter-top friendly, the Barrier Light directs all diagnostic information to its companion app on your phone. This allows the Barrier Light to have an incredibly small form-factor, enough for it to even be carried around in a purse/bag. The piece-de-resistance however is the MyBarrier app, which breaks down the information sent from the pen and presents it in a simplified way, telling you if your skin-care routine is doing you any good, or if the environment is conducive to good skin. The Barrier Light puts a dermatology clinic in the power of your hand. While we all have home-based instruments to measure our temperature, weight, blood pressure, and even blood sugar, we don’t give our skin the same priority. With the Barrier Light, now you can know everything about your skin and effectively your health too. From whether your sunscreen is doing you any good, to whether your laundry detergent is skin safe, to even whether your diet is the best for your health and skin, the Barrier Light will make sure you know what to do to keep your skin young and glowing!